In the SEO industry, a common misnomer is ‘Content is king’. While the content on your site is significantly important, there are some aspects of SEO that if ignored, no matter how robust your content is, your site will be stifled by low search rankings. In addition to securing your site, how quickly your site and landing pages load directly affects your search rankings. 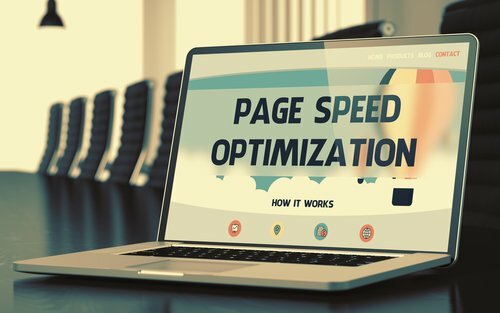 Here are Boston Web Marketing, we wanted to write a blog on some best practices regarding how to increase your site speed. With more searches coming from mobile than ever (more than 60% of search queries come from a mobile device) if your site can’t load quickly on a mobile device, Google will push your site further down in rankings. Optimizing your site for mobile can include making images, text boxes, menus and maps ‘responsive’. A responsive site means as the screen size changes, it is re-formatted to be an easier read for those on smaller screens. Web hosting is where your sites files or pages physically live. Since buying and maintain one’s own server to do this doesn’t make sense financially, there is a need and market for companies providing hosting. Depending on the number of files on your site, overall traffic, and the amount of security required for your site, hosting providers can vary in terms of capabilities and pricing. The term, you get what you pay for rings true in this sense. Cheap hosting providers often provide slower load times as their servers are not as powerful in addition to offering little to no service in case something going wrong. Here at Boston Web Marketing, we have several hosting providers we recommend based on your site’s need. We have no affiliation with these providers and recommend them based on price, load times, and level of service. If you are in the process of customizing your site, the content management system you are using will most likely give you the ability to add plug-ins. While plug-ins are great for this purpose, be sure that you do some research and monitor a newly added plug-in’s effect on your site’s speed. Also, be sure to investigate whether plug-ins that were added prior are updated, as plug-in providers are constantly improving the functionality and speed of their products. Boston Web Marketing can increase your site speed! Is your site slow to load when on a desktop or mobile device? Is your business’ site not ranking on the first page of Google despite great content? Boston Web Marketing’s team of SEO reps can help increase the speed of your site leading to an increase in traffic. From there, we ensure users are directed to some type of conversion or goal in order to increase leads for your business. If you have questions regarding site speed, mobile responsiveness, hosting, or any other SEO best practices we implement on a daily basis for our clients, give us a call today!